Unilever and the Millennium Village Project unveiled a new partnership today to mark the 5th Global Handwashing day. The partnership aims to reduce diarrhoeal diseases by improving hygiene in MVP villages in Ethiopia, Ghana, Kenya, Malawi, Mali, Nigeria, Rwanda, Senegal, Tanzania and Uganda. “Diarrhoea and pneumonia are the two leading causes of under-5 deaths, accounting for around 30% of children's deaths globally – more than two million lives lost each year. More than 80% of these deaths occur in sub-Saharan Africa and South Asia. Addressing these challenges through improved hygiene is a vital and effective step towards saving lives and achieving the global Millennium Development Goal to reduce the child mortality rate by two-thirds by 2015," said Jeff Sachs. Handwashing is a major priority for the large multinational Unilever. "This is not necessarily about donor money. The goal is not to make soap a free thing. What needs to happen is for it to become a daily routine and it will become an unquestionable expense," Dr. Myriam Sidibe, Social Director for Lifebouy told me last year. For Unilever, supporting handwashing provides away to create a market for their product while engendering healthy habits. 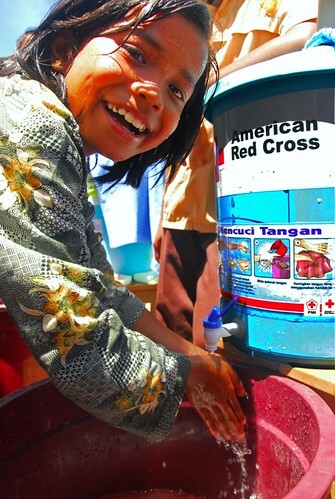 Studies have shown that regular handwashing can reduce pneumonia and diarrhea in children. Compared to other WASH interventions, handwashing with soap is both cheap and effective when comparing health benefits weighted by price. Ensuring that people regularly wash their hands means improved health outcomes and business for Unilever. Sidibe explained the motivation in a July post in the Huffington Post writing, "For Unilever, the moral case is clear -- we know we can improve and save lives through our products and by changing behaviour. Moreover, the business incentive is clear -- our Sustainable Living Plan commits us to doubling the size of our business while improving our impact on society." The partnership between Unilever and the MVP aims to reach 500,000 people by supporting household latrines, access to safe water sources and educating about handwashing with soap. "For a company like Unilever, proud of its reputation, a commitment is a real bottom line. Fortunately, the company's bold commitment is also matched by expertise, distribution networks and management acumen to reach vast numbers of people and help them improve their lives. The partnership of Unilever and the Millennium Villages Project will be an important step on the road to success," writes Sachs in the Huffington Post. Diarrhoeal disease is responsible for the death of 1.5 million children each year, estimates the WHO. That makes it the second leading killer and the leading cause of malnutrition for children under the age of five. The good news is that many of the problems can be avoided with proper hygiene and treatment. “It is unacceptable that two million children die every year from infectious diseases when we have easy and cheap lifesaving solutions, such as handwashing with soap, readily available. Innovative partnerships between governments, civil society and business have a critical role to play in promoting better hygiene practices and in tackling the world’s deadliest diseases,” said Unilever CEO Paul Polman. Disclosure: I write the Impact blog for PSI, a partner with Unilever on handwashing.